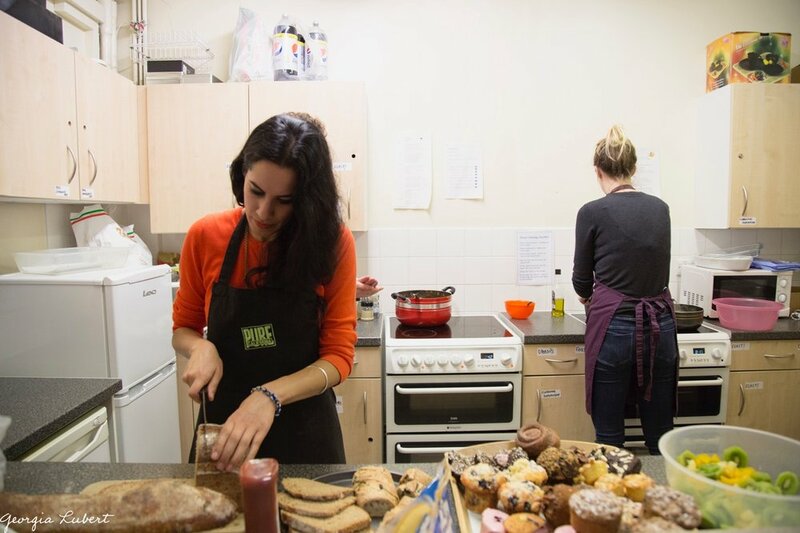 Since June 2015, FEAST WITH US has been collecting surplus food from North London retailers, taking it to community kitchens, and cooking 3-course meals for vulnerable adults on a weekly basis. 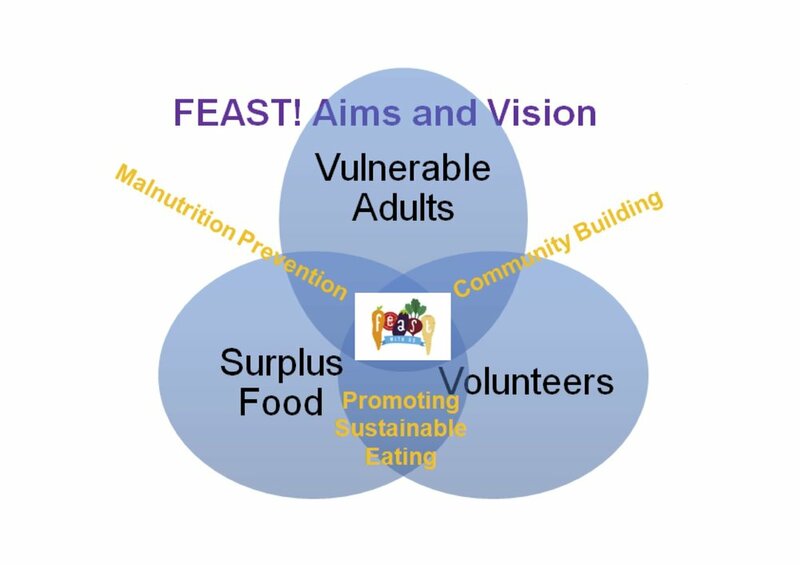 FEAST WITH US provides access to regular meals for people suffering food poverty. Not only are our meals delicious and nutritious, they are made from 'waste' foods that would otherwise be thrown away. 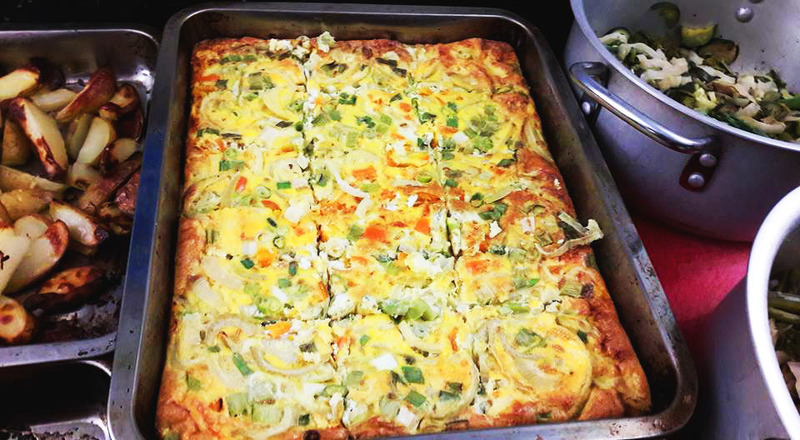 On a weekly basis, volunteers are able to socialise and prepare meals with vulnerable adults from all walks of life. The intimate setting of a communal kitchen creates a family atmosphere and togetherness that is hard to replicate in other services offering meal provision. Volunteers and service-users are encouraged to befriend one another, share the space as equals, and dine together, as equals. “Coming to a FEAST! is spiritually uplifting... it creates a community connection that is rare nowadays. Hannah is a dietitian by day, and a community innovator the rest of the time, Hannah founded FEAST! with the view to marrying her work with her passion in 2015. Since this time, Hannah has directed FEAST! to become an inclusive space, and has focussed on the wider role FEAST! can play as a public health initiative. Hana is the Fundraising Trustee, with previous experience at Great Ormond Street Hospitals Children's Charity, The Children's Society and NSPCC. Hana has volunteered with FEAST! and has helped create nutritious food for the residence of FEAST! Simon is a chartered accountant, company director. and experienced businessman working at a senior level for companies ranging from large multinationals to microcompanies. He works in fields as diverse as high-tec and communications to property management and keycutting. He is involved with a variety of community organisations in various capacities from trustee to project co-ordinator to events organiser to entertainer. To Volunteer now, click one of the buttons! If you would like to find out more about us, enquire about partnerships and how you can help, please fill in the form below.